If you work in the healthcare profession and face the day-to-day challenges that are unique to the industry, you may be slightly offended by this blog’s title. Implying that assaults and violence could be considered “status quo” or acceptable in a field that is dedicated to helping others seems absurd on the surface. The problem, however, is that a majority of nurses have been assaulted on the job and it is well-known that incidents of assault on hospital staff are under-reported. Statistics can fluctuate greatly in terms of the percentage of nurses who report being assaulted, but I’ve never seen any research that puts the number below 50%. Assault rates like these confirm what a five-year Bureau of Labor Statistics study from 2003-2007 told us. According to their research, healthcare workers during those years were five times more likely to be victims of nonfatal assaults or violent acts than all other occupations. If you ever needed a compelling reason to take action to improve your workplace safety, this statistic was it. When you fast-forward to today, why is it still so difficult for healthcare facilities to adopt new security technologies for their sites? I’ve pondered this question for some time, recognizing that there are many purpose-built solutions out there for healthcare security (like the Pro V2 Enhanced Non-Lethal device). In a world where security-related issues are a talking point in almost every evening newscast, why would there be resistance to adopting tools that are designed to better protect workers in violence-prone environments like healthcare facilities? “Shhhhhh! You can’t say that!” says the average hospital administrator. And therein lies the answer to my elusive question. It’s not that there’s blame to be arbitrarily assigned to anyone who holds a high-level administrative position at a hospital. These folks have a vested interest in making sure their facilities operate efficiently, service patients in a caring manner, and live out their mission statements in plain view of the public they serve. That’s a tall order and a very different mission focus than the line-level nurses, staff, and security personnel who come into contact with a wide variety of people suffering from many different types of problems. I believe the reason why some healthcare facilities seemed to slow-roll taking demonstrable action to deter violence based on the old Bureau of Labor Statistics’ findings was (and is) pretty simple and understandable. It’s a touchy issue to publicly acknowledge that sites designed to be a safe haven for those seeking medical care are actually extremely dangerous environments. If a defensive tool suddenly shows up on a security officer’s duty belt or if a hospital announces that it is taking proactive steps to protect its staff, the implication to the public is that violence has run amok. And trust me, I can understand the hesitation to act from a “political” perspective. Unfortunately, the data on violence in hospitals doesn’t discriminate between what’s socially-acceptable and what’s real. Even newer incident rates from 2013 that were published by the Bureau of Labors Statistics (BLS) were so compelling that they served as the foundation for updates to OSHA’s Guidelines for Preventing Workplace Violence for Healthcare and Social Service Workers publication in 2015. The BLS data at that time showed that workers in the healthcare and social assistance industry were nearly four times more likely to be injured by violent acts than workers in the average private sector job. The most recent BLS data still shows a huge disparity between incidents of violence in these fields. Although the trend is slightly down, healthcare and social assistance workers remain at exponentially-greater risk of being assaulted on the job. I contend that this trend IS an epidemic and should NOT be viewed at the status quo or “just part of the job.” Even law enforcement officers who face assaults regularly understand that even though danger comes from walking the thin blue line, it is critical to have tools that can help meet the threat. The threats facing healthcare workers are real and well-documented, and there are dedicated staff roaming the halls of nearly every hospital who are tasked with helping to keep them safer. Provide your security officers with a tool (I’d suggest a Pro V2) to help deter, de-escalate, document, and defend against violence in hospitals. Simply having the visual deterrent of a protective device on a security officer’s duty belt will communicate to potentially combative patients that your hospital has a zero-tolerance policy for violent behavior. And if challenged, the security officer will have something to not only protect him/herself, but also the hospital staff. With a Pro V2 on-board, the encounter could even be recorded to help protect the facility from liability. 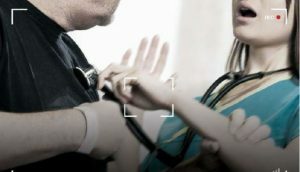 There are ways to stem the trend of violence in healthcare settings and the best approach is undoubtedly a layered one. Beyond the internal workplace violence awareness programs, risk assessments, and safety plans, a more formidable (and visible) external-facing option is needed to communicate to potentially violent patients and visitors that being combative with staff will not be tolerated. If administrators are afraid of the political backlash for equipping security officers with a defensive tool, I encourage you to ask those who have taken the proactive step to better protect their staff by implementing a device like the Pro V2. I think you’ll find the fears to be unjustified and the benefits to out-weigh the costs of doing what is necessary to treat the epidemic of assaults on healthcare staff.